Carlo Ancelotti has persisted with Fernando Torres, despite the £50m striker being short of form. All is not well at Stamford Bridge. As the most important match of their season looms large, Chelsea’s dressing room looks to be in disarray. Carlo Ancelotti’s failure to manage his strikers since the signing of Fernando Torres means the team is not in the right frame of mind to battle Manchester United at Old Trafford in a crucial Champions League quarterfinal. Last week, in the first leg of this tie, I had the opportunity to sit a couple of rows behind the Chelsea bench at Stamford Bridge. What I saw during the game should worry everyone who is interested in Chelsea’s immediate and long-term future. There is no question Ancelotti made several mistakes which could ultimately cost his team a place in the final four of Europe’s top club competition. Let’s start with team selection. The Italian manager lined up with Didier Drogba and Fernando Torres up front. He made this decision even though Nicolas Anelka was the side’s top scorer in the Champions League with seven goals in seven games and even though Torres had failed to score a single goal for club and country in over 11 hours of play. What message did he send to his team by doing this? Surely, only that factors other than form - namely a £50 million price tag - dictate tactics. This was hardly the rallying cry needed before such a key contest. Ancelotti needed team unity but by unsettling Anelka, is in risk of upsetting the core of his squad and many of the established internationals in the side. As bad as this pre-match decision was, the Italian coach could have made amends during the second half of last Wednesday’s game. However, in the face his side trailing to a brilliant Wayne Rooney goal, he changed nothing; he left Torres toiling on the pitch. The Spaniard was running and working as hard as he could, but it was clear he just did not have a goal in him. A first-half chance to redirect a Drogba cross into the net was missed, and for all his huffing and puffing, there was little or no end result. If I couldn’t understand why Ancelotti was sticking with Torres, just imagine what Anelka was thinking. I watched the Frenchman warm up in front of me, looking like a man with little motivation and little purpose. We all know he is not exactly the most driven player on the planet; it is not by chance that he is known as “The Sulk”, but on this occasion he had good reason to feel aggrieved. Finally, with 20 minutes left, Ancelotti decided to make a change. The crowd spurred Anelka on as he jogged over to the bench to receive instructions from the Italian manager. However, what I saw next revealed that Carlo has lost the plot. It started with a conversation that the coach had with the player before he came on. As Ancelotti started talking to Anelka, the striker did not look at him or acknowledge him once. I am assuming Anelka listened to what his manager had to say, but just stood there motionless, before slowly walking to the sideline to come onto the pitch. At this point, I and most of the Chelsea fans were expecting Anelka to come on for the ineffective Torres. We were wrong. Instead it was Drogba who was taken off. The Ivory Coast international couldn’t understand it. He looked at Anelka in disbelief and started making his way off the pitch with a sarcastic smile on his face. As he left the field of play, he couldn’t help himself and just started laughing. 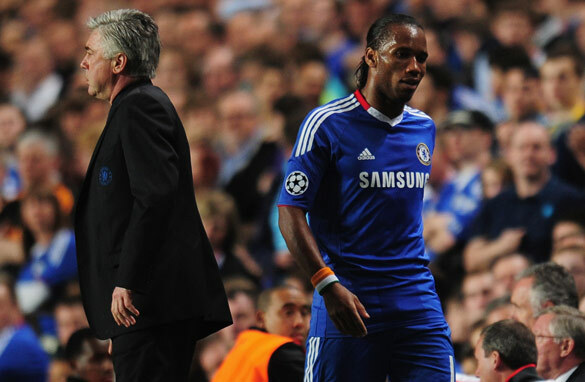 He didn’t think about whether Ancelotti saw him or not, but then again, at that point in the season and of his career, Didier probably didn’t care. He walked over to the bench, sat down, and continued to chuckle. While you could be tempted to judge the attitude of Didier, Nicolas or any other player which reacted in disbelief to this substitution, let me just say that I understood their frustration. This is a team that has been desperate to win the Champions League for several years. They have made at least the quarterfinals in five of the last six years. They lost a semifinal against Liverpool with a goal that may not have gone in. They lost a dramatic final on penalties to Manchester United. This is a group of players who have given their bodies and souls to win this competition. So if they are upset at not being allowed to do what they feel they can do, I can sympathize. So what did all of this mean? First of all, it clearly showed that Ancelotti has lost the dressing room. He will be on the way out this year unless he wins the Champions League, which considering the current state of affairs, doesn’t look like its going to happen. Ever since Torres was signed, it has been clear to see that he has struggled to manage his strikers and is now paying the price. I wonder if Roman Abramovich is pushing Ancelotti to play the Spanish striker, just like he pushed Jose Mourinho to play Andriy Shevchenko a few years ago. It created tension then and it is creating tension now. Unless Carlo works a miracle and manages to right the ship in time for Tuesday’s showdown, then Chelsea are doomed to win absolutely nothing this season. Pedro already making excuses for Chelsea. What happened to your Chelsea vs. Inter semi-final, not looking so good right now. Not long ago, Journalists were questioning the chemistry between Drogba and Anelka – and now this is conveniently brushed under the carpet to make way for the flavour of the month story which is Torres being incapable of playing with another striker. The facts are that ANY striker needs minutes on the pitch and, i think, Ancelotti made the correct decision leaving him on. Looking at playing style, the textbook says that Torres would actually benefit from playing with Anelka compared to Drogba. Anelka plays in the hole, linking midfield and attack, which is badly lacking from Chelsea's current midfield who are used to longer balls to Drogba as a focal point of attack as a target man, and are not used to the style of play whereby the striker plays off the shoulder of the last man, looking for the run in behind the defender. Anelka is one man who can spot a pass – Drogba isn't that type of player which is why the chemistry with him and Torres isnt there. Looking at EPL stats I think Ancelotti is well within his rights to start with Torres, considering the massive goal drought Chelsea Strikers have been on even before the Torres arrival, so whilst I respect your opinion – I disagree. In the big picture, I believe Torres will be a great addition to Chelsea – but when someone is essentially shoehorned into the line up there will be teething problems. But with Benayoun now fit, as well as Mceachran being introduced into the first team, who's range of passing is just superb, and I am sure will be comparable to Iniesta in years to come, Chelsea's style will begin to suit Torres and his style of play – and alongside the ushering of Drogba to a benchwarming role next year (as well as the addition of a winger, hopefully Alexis Sanchez, and the recalling of Daniel Sturridge from Loan) I am hoping that Chelsea will be rejuvenated for years to come. Abramovich is pushing Ancelotti to play Torres. Ancelotti had no say in the buying of Torres at all. Abramovich buys the players he feels are big and will keep the fans happy such as Torres and Shevchenko. Ancelotti was brought in to do a job as was Mourinho a few years back, so if Abramovich is not going to let them do the job he has hired them to do why bother hiring them in the first place? Ancelotti is the manager it his up to him who he signs and who he picks to play not Abramovich. Torres is a bust this year, but he didn't become a bad player overnight. Chelsea bought him in the expectation that Drogba would be moving on, possibly in January, but seemingly now at season's end. In the meantime, Ancellotti has 3 strikers any two of which are not the perfect combination. Torres needs and orthodox target man to play off, and neither Drogba nor Anelka are that man. Torres needs an orthodox winger, and he doesn't have one at the Bridge. The nearest to a winger at Chelsea is Malouda and he doesn't really fit the bill because his instinct is to cut inside for quick one-two's before shooting. Torres needs a thread-the-needle type midfielder, instead he's got Lampard, who's more prone to shoot than pass, and Ramirez, who's a rampaging head down and charge kind of player who runs at the spaces where Torres wants to go effectively making the Spaniard redundant. Consequently, the current Chelsea line-up does not suit Torres. But, when you pay 50 million you're not going to leave the guy on the bench, so you play him and he looks bad. Next season, with or without Ancellotti, it will be fair to judge Torres, at least if Chelsea spend some cash in getting the players to bring the best out of him. Right now, he's a misfit through no fault of his own. TORRES is OVER rated player.50 Million!My God.He deserves to play in a club like Wolves, Wigan or other small teams to improve. LIVERPOOL manager is very smart!He bought excellent and fantastic striker instead of Torres. Pedro I appreciate your analysis.Well articulated. Find out how much chelsea made in salling of his (Torres) jessy alone. So let Torres be and Anciloti be as well. Lets hope things works better next season. I think the problem we are having now in chelsea is the owner Abramovich, If he can allow managers to do their jobs i believe they will put their best and give result, You must agree with me that Torres is never a good signing for chlesea but because the owner wants him at all cost that is why he was signed, And now seeing that Torres is not in form why not keep him behind in some crucial matches than using him to do experiment, And even the manager is just like Torres he has nothing to deliver, Chlsea should stop going for names that has already exired. Carlo expire at Milan and Tores at Liverpool. Torres did not worth £50 000 000 is that is the problem he is having now. I think Torres will click,but now he is not there at all.So i suggest he stays off the line-up now, and let Anelka and Drogba handle things now as they use to. Pedro, i saw asnd noticed what you said about the selection and the sub too.Even though am not Chelsea fan,yet i feel for them. Pedro, your analysis is correct and fantastic.What i understand is that Carlo is trying to defend his signing, Torres.So get ready to replace Carlo. Up BLUES,long life 2 all CHELSEA Fans.TORRES is a gud player rite 4rm liverpool, since he was signed into blues pressure had been on him bcos of wat his fans expected him 2 do.He is tryin his best actually, but at dis process of puting his best effort he wil b makin mistake 4r nw,wat i belive is dat by next season TORRES wil prove him self 2 CHELSEA FC and d entire BLUES fans.thanx long life blues and dfans. All you have to do is look at the next league match and see that none of the strikers are in form. While sturridge is banging in goal after goal for Bolton you have to wonder why Ancelotti has not given much thought to youth. I remember him saying that he was going to use his youngsters far more this term. They have all been farmed off. He had the perfect opportunity when Chelsea were misfiring long before Torres arrived on the scene, however he only ever brought Sturridge on for a few cameo's. How a Center foward is supposed to find their place in the team with that sort of time on the pitch shows Ancelottis short comings as a manager, one being his lack of vision and forethought. His first season as manager saw no youth players coming regularly into the side. Which to me shows a lack of courage and more of a will to keep his job than develop his team and club. Torres is the right player for Chelsea as a direct replacement for drogba. He is however not suited to play with Drogba. The Ivorian is now being asked to play a different role for Chelsea than the Spearhead he is used to in the successful 433 formation that has helped Chelsea win the titles they have. Should Chelsea have bought a smaller more skillful player like Tevez or Neymar? Either would have been a fantastic addition allowing Chelsea to play a 442, with the play-maker dropping deep to get the ball and either running at the opposition or playing in the big front man. Have Chelsea got a chance against United tonight? It's going to be extremely tough. United are going to have to buckle and if Terry is fired up then anything can happen. Luck and refereeing are likely to play their parts as these games are always to tight to call. Prediction 2 – 2 with Chelsea chasing the game. I am from Liberia and a Chelsea fan. To be realistic for tonight Champions League game with Man United,the Team(Chelsea) can stay advance to the Champions League Semi final. If the Manager could just rest TORRES and keep the old guys on the field, the team will have a good result tonight. Even Solomon Kalu could come on second -half to end Man United dream. Pedro,just last week, you did the great mistake of calling a wet lion a cat by undermining United's treble ambitions. Then you come up with this lousy analysis on why Chelsea lost the plot. Most readers however did warn you that you only write off United at your own peril and I think it is best for you to stick to your guns about Chelsea making it through to the Semi-final and just in case they do not, swallow the humble pie and give the plaudits to United's passion and belief this season. That hunger and never -say-die- attitude that has set them on a pedestal and eluded most teams this season. To take away the gloss from that United perfomance a week ago by blaming Carlo's tactics and the draconian regime under Abramovich is disturbingly unfair. United played like true champions and it takes even the ardent of Chelsea fans true grit to admit that fact. This season clearly is over for chelsae.Nothing will make them win any cup this year.United is simply unstopperable.United,no size. Chelsea was sent packing, there was no domestic ref to help their cause. Now as for you Pedro you are hack of not who has been exposed time and time again. Where is your inter vs chelsea semi now.wishing and analising the game are two diffferent things.stop imbarrassing yourself. Ancelloti is bereft of ideas on how to manage the array of stars in his team, He doesn't consult his assistance Emenalo, which a shame to him! Ancelotti has simply lost it, it is obvious he doesn't know what he is doing. He doesn't know capabilities, skills and strength the players. He can't even justify why he started Didier Drogba from the bench if in his own post-match briefing admits that the striker is stronger and puts pressure on defenders. If that is so, then why start him from the bench ? The price tag ($ 80m ) on Torres gives him automatic selection whereas the brand name of "LAMPARD" also gives him automatic selection. As for Malouda, the least said about him the better. You don't have to be a super coach to realize that, playing one man up front with a goal down in the 1st leg was wrong. He should have gone for 4-4-2 formation because we needed goals. To make matters worst, Ancelotti bought on Ferreira who is a defender while we needed goals and we were also a man down. There was nothing to lose bringing on an offensive midfielders like Zhirkov or Benayoun., we needed goals for God sake. Ancelotti must go. Am a strong Chelsea supporter and I don't think Ancelotti is the man for us next season. He must go !!! well i said it when it matters most Manu will always deliver.what chealse need to do is stick with a manager for a long tyme who will b able to built a formidable force,coz chealse got talent,the idea off changing coaches avery season will not do no good for them.Also Ancelotti should not stay at the helm,he ought to resign. Tony – players and managers are very alike in ways, they all need time to settle, especially on such a big stage like the Premier League. I agree Torres and Lampard are out of form and should not been in the starting line-up. However, if Ancelotti leaves out the big names such as Terry, Lampard or Torres all of a sudden he will find himself under fire not just from the fans and the media but also his very passionate owner. Ancelotti had no say in the signing of Torres, that was Abramovich. Abramovich signs the biggest players in football to try to achieve his dream...to win every trophy available and the one that has escaped the clammy hands of now a corporate Chelsea is the Champions League. Ancelotti will be gone at the end of the season as all Chelsea managers are now brought in to do just one thing and that is to win the Champions league. He has failed this season, so we will see a new manager at the Bridge next season. Am a big fans of chelsea, I jst luv d team more then anything. I think Ancelotti has simply lost it, or maybe Abramovich is not allowing him do what he (ancelotti) know's how 2 do. Am not in surpot of sacking Ancelotti cos what I think chelsea needed is a long time coach like sir Alex nd Arsane wenger. Also Abramovich should give him a chance 2 do is job's. Am not happy at all, champion's league is what will want. To face the reality, i think chelsea are not doing well of late. The individuality rising up within the players does not help in a very good output. For instance, malouda slows attack of late, drogba thinks he is the best, lampard cannot link up very well with the strikers and the worse of it all is carlo ancellote's inability to select the right players for the right match. Carlo does not get his subtitutions right of late which is a bother to the team. I must also say that the owner should leave carlo to do his job so the team can play very well. Long Live Chelsea. This was a good analysis Pedro – but it comes after some blundering prediction that it was gonna be Chelsea vs. Inter in the semifinals! I think for Pedro it takes falling from your high horse for you to make objective assessments. A few months ago you were raving & ranting about the demise of English football, effectively consigning it to the dustbins of history. Now that the best English club at the moment, Man U, may be facing your favorite Spaniards, what's your prediction now?? Please predict a Barca win because, like all your predictions, they don't come true!!!!!!! Well Pedro, what happens is that Chelsea lacks the tradition. Obviously, when it matters, the big clubs are the big clubs, and the ones with a lot of money don't become big clubs overnight. FC Porto, from Portugal, won 2 champions league, 1 uefa cup, 1 european supercup and 2 world titles. They never had (and never will) the money of Chelsea, but they're a big club with a lot of tradition. That's worth a lot. Chelsea is a small club with a lot of money. In Europe, they can never compete with the likes of Manchester, Real Madrid, Barcelona, Milan, Inter or Liverpool. Hilarious how this guy Peetroo, as he calls himself (look mate, CNN is broadcast in English to global audiences, so just keep it simple, and call yourself Pedro, as most people are more comfortable with that) tries to make everyone think a few weeks ago, when Manchester United were drawn against Chelsea, that it was a 'given' that Chelsea would simply overpower United, and book a date with Barca in the final at Wembley. Really Peetrooo? Where do you stand on that now then??? I recall giving you a lesson in what 'form' is all about, and that things can change dramatically, as it may for United even in upcoming Semi against Schalke 04, but point it that you do NOT go around spouting nonsense about form and making it sound so matter of fact. Fact it is United pretty much ran rings around Chelsea, and yes, perhaps Schalke 04 may be trickier than many expected, especially with Raoul in their ranks. But anyway...point made. Anelka – Drogba combination has always worked in the past and it still can......... but more than the attacks its midfield where Chelsea need restructuring ....... They should go for the Barca pair if they can afford it ! The problem is not with Carlos, and has never been with any of the mangers, it has always been the owner.. he wants to play both roles, owner and manager, that was the problem he had with Jose, Jose did not let him act as the manager. All the buys made must come from Roman's table, and as for Barca's pair, he can't afford them..
Carlo and his boys are still in the race. No point in writing him off so soon. The EPL looks set for a close finish. I think we should take it easy on the manager the decisions are not all the time made by him. And now Ancelotti is water under the Bridge!